Bailey the Wauzer at 3 years old—"Bailey loves to play, watch TV and visit with all kinds of people. 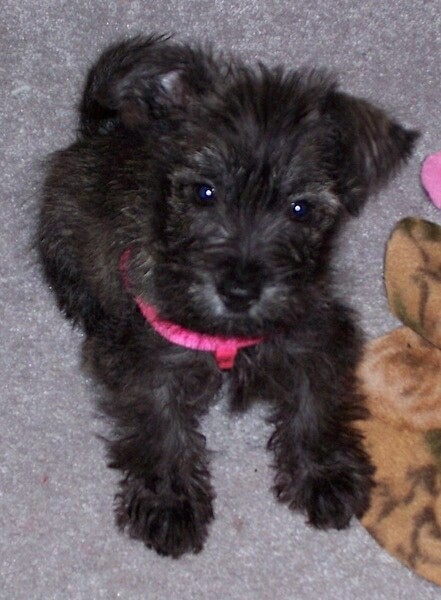 Bailey's mom was a Schnauzer and her father was a Westie (yet she looks like a Cairn ))." The Mini Wauzer is not a purebred dog. 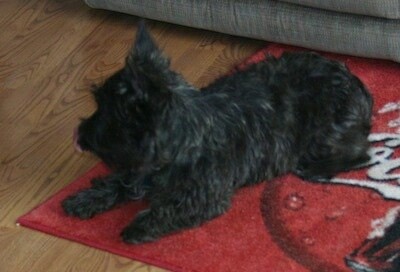 It is a cross between the Miniature Schnauzer and the Westie. The best way to determine the temperament of a mixed breed is to look up all breeds in the cross and know you can get any combination of any of the characteristics found in either breed. Not all of these designer hybrid dogs being bred are 50% purebred to 50% purebred. It is very common for breeders to breed multi-generation crosses. Wiggles the Wauzer at 8 months old—"Wiggles is a Wauzer (Min. 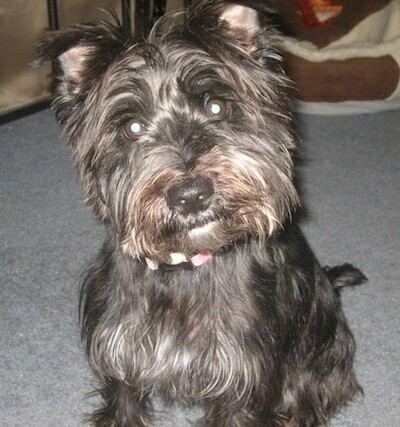 Schnauzer and Westie mix). 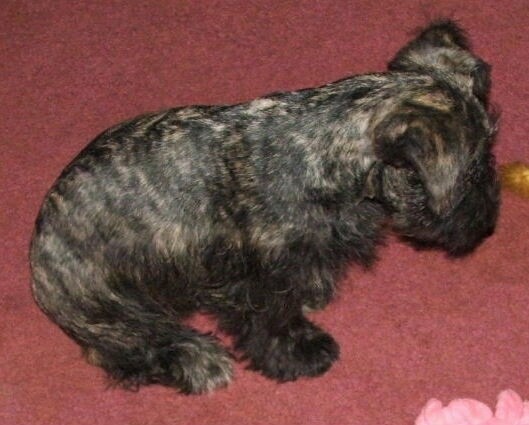 She is dark brindle in color. She is a sweet, happy dog. She is a wonderful, happy-go-lucky pet that does not shed. Great pets for kids from 1 - 90." 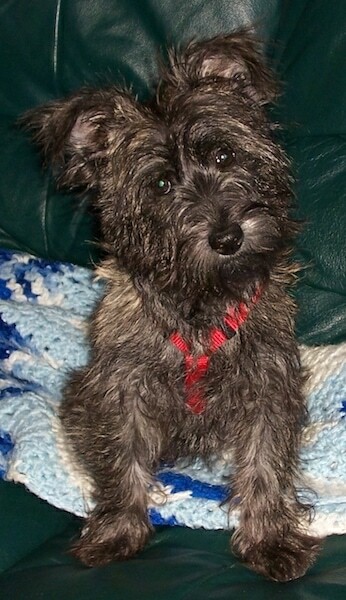 Emi the dark brindle Wauzer at 6 months old—"I think she favors the Schnauzer side. 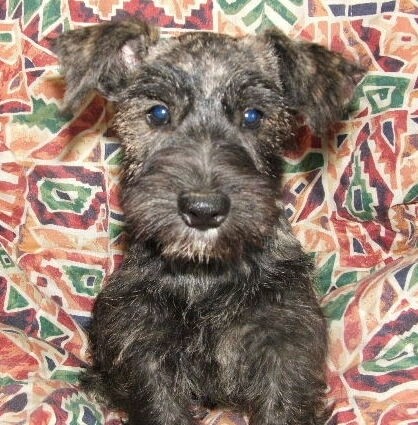 Her beard is very noticeable, but can't tell if its going to be like a full beard as I've seen on full Schnauzers. the hair on her legs is very obviously growing much longer now also. She's a very energetic, loving , smart dog. She is brindle in color. In pictures the brindle doesn't show up much. In her puppy picture she looks much blacker, in this shot the brindling shows up much better. At 6 months old she weighed 10 pounds." "This is the first day I brought Emi home. She was nine weeks old weighing 3.3 pounds." Gus the dark brindle Wauzer as a puppy at 5 months old—"Gus is a brindle Wauzer. 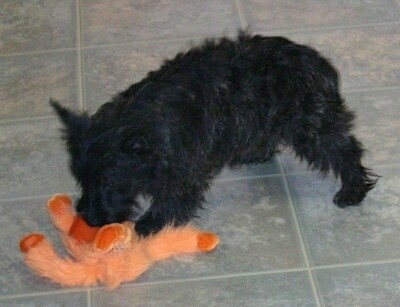 He is a puppy, age 5 months old in this picture. He is very cute and active, not hyper! 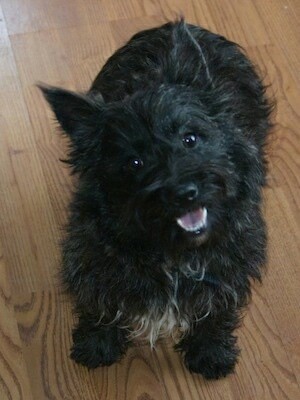 His dad is a Westie and his mom is a salt and peper Schnauzer. At 5 months he weighed 16 pounds. His coat is soft. 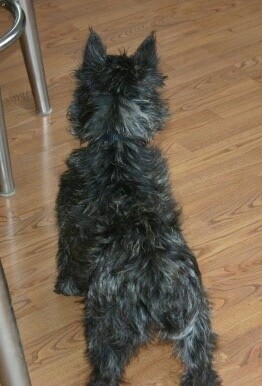 He is clipped like a schnauzer. His ears are natural. He loves his toys. He lets you know if someone is around."